With some of the heavier meals that I have been having recently I was looking for something lighter for breakfasts this week. When I am looking for lighter breakfasts, egg casseroles often some to mind and this time I was thinking of something more along the lines of a quiche. Broccoli is another one of my favorite green vegetables available during the winter and I had been wanting to use it in something so I decided that a broccoli quiche was the way to go. 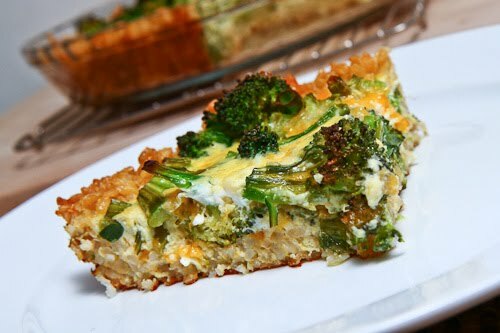 Of course the natural combo of broccoli and cheese came to mind and I was immediatly thinking about broccoli and cheddar soups and broccoli and cheddar gratins and why not a broccoli and cheddar quiche? Although I really enjoy nice and light and flaky all butter pastry crusts with my quiche, this time I decided to go with another really nice crust, a brown rice crust. The brown rice crust is essentially just some cooked brown rice along with some cheese and an egg for binders. The brown rice crust is bre-baked for a bit and then it gets a little crispy when it bakes with the filling in it and it holds together quite nicely. One of the things that I really like about breakfasts like quiches is that they keep well in the fridge and the leftovers just need a few minutes in the microwave and you have a warm and tasty breakfast suitable for a busy work day morning. Note: I used a nice sharp and strong cheddar cheese in this recipe and if you are using a milder one you may want to double the amount that you use. Mix the rice, cheese and egg in a bowl. Press the rice mixture into a pie plate, about 1/4 inch thick. Bake in a preheated 450F/230C oven until the edges and bottom just start turning golden brown, about 5-7 minutes. Mix the eggs, milk, broccoli, cheese and green onions in a bowl and season with salt and pepper. Pour the egg mixture into the pie crust. Bake in a preheated 375F/190C oven until golden brown and set in the center, about 30-35 minutes. That's creative!! I have to try the brown rice crust!! I love a good quiche! Ooh, all that broccoli looks so delicious. Kevin, this is incredible using rice as a crust, I would have of that in a million of years. I love broccoli too! this Y.U.M.M.Y!! This sounds yummy and I am going to try it sometime. Thanks for sharing it! I like the rice in this dish…looks really yummy! Broccoli, cheddar and eggs are my favorite omelet combination so I KNOW I would love this. Such a classic! What a great crust idea and great for breakfast too. Mmm this looks yummy. Thanks for the recipe! This looks great. I will try this very soon. I have broccoli right now. I love broccoli cheddar quiches. Using brown rice for the crust is very creative, my gluten intolerant friends will love this. When I make my broccoli cheddar quiches I like to add sliced tomatoes on top before baking. very clever using the brown rice. I luv it…simple, but elegant! I have tried your brown rice crust and it is delicious, let me tell you. such a healthful alternative to a butter crust. I have always wanted to try a rice crust. This sounds really perfect for a GF diet. I am going to share this recipe with some friends! It's fun to find something different to make! Dinner tomorrow night at our house! woo hoo! Good call on the brown rice crust. Shredded potatoes make for a nice crust, too. This looks devine! Quiche is such a great cold weather comfort food. I love the idea of a brown rice crust!!! Love the alternative crust! Will definitely have to try ti some time. This looks gorgeous. I can't wait to try it. What a great, thrifty idea. I wish I'd seen this before I ate up my leftover risotto (cooked in a mushroom broth) – I think this would have worked well for this, too. By the way, I love that your blog features a lot of "everyday" cooking. Some of the other food blogs tend to use more expensive ingredients or complicated recipes. I like that yours has a lot of quick-and-easy pantry-type recipes that are quick after work. I love the brown rice crust here Kevin. This sounds so delocious! Awesome! I've been thinking about using some quinoa as a crust for a tart or something lately, but wasn't sure how to get the crust to be nice and crusty… This is a great help! And your filling is awesomely delicious looking! Can't wait to try it! I'm eager to try this crust…great idea! Amazing! My mom's been into brown rice recently to cut down on her cholesterol, and we'd been getting sick of eating brown rice salad. This went together really easy. I added some mushrooms and topped it with tomato slices because I had them, and used yellow onion instead of green just for personal preference. I ended up using just one 12-inch skilled for the whole thing, sauteed the mushrooms and onions in a little olive oil, then added a few tablespoons of water to the pan(after removing the mushrooms, but I left in the onions because I like them soft) and popped the broccoli in to blanch for a couple of minutes, transferred it, drained, to a platter, wiped out the pan, and assembled the crust in that same pan which is oven-proof, filled, and back in the oven for the last 30-35 minutes. I used a basmati brown rice that is nice nutty/chewy, for the crust. This will be great for breakfast in the morning too! Looks like a perfect breakfast Kevin! Love the brown rice crust. I made this for Christmas morning. Mom is a diabetic and is really great about watching her carb intake so the brown rice crust gave a nice alternative. I cooked the brown rice the night before. It was pretty good. There was a ton of broccoli to fit in, but amazingly enough, it fit! I like the idea of adding mushrooms &/or tomatoes that others tried and commented about. I'll have to try that next time. I had some problems with this recipe. The crust needed to cook for 12 minutes (rather than 5-7) before it began to brown; then the broccoli didn't fit in a standard pie shell even after I poured off about a third of a cup of the milk (did you use deep dish)? Also I caramelized a yellow onion and minced it with some red pepper flakes for flavor. Overall the result was good but still somewhat underspiced and it didn't firm properly in the center when the edges were completely done. Good ideas, but needs tweaking. ian: How thick did you make the brown rice crust? A thicker crust would both need more time to cook and have less room for filling. It should really only be 1/4 inch thick at most. That being said, with the 2 cups of broccoli it is really piled in there with some of it peaking out above the quiche and it gets nicely roasted and it is packed with flavour. I like to use a pretty strong cheddar cheese in dishes like this so that I can cut back on the amount but the cheddar and broccoli should be the dominant flavours. I like your addition of the red pepper flakes! I was looking around on your blog (which I love, by the way) for a quick recipe for dinner and came across this. I wasn't totally sold on the brown rice crust coming out well, but it turned out great! I love regular quiche, but this was awesome and so much healthier. Thanks! I made this tonight and will definitely make it again. My only problem was that it took 50 minutes to set in the middle, so next time I'll plan for that or just use less milk. The nutmeg was fine, but I think a dash of cayenne would be a good substitute. Thanks for the recipe! Kevin – I've made it a few times now and it always takes 50 minutes. The middle is completely unset at 30 minutes. I just plan for the extended cooking time now, so it's all good. 🙂 I've also discovered that I like using pepperjack instead of cheddar. Delicious! Hi Kevin! Made this quiche the other night and it was ah-mazing! Love the idea of using rice in place of a crust. We had enough leftovers for breakfast the next 2 days as well. Thanks for sharing your great recipes! This was delicious! I will make this again. it turned out great!!! I did sub the cheese in the rice crust with swiss and added chopped bacon. Very delicious and thank you for sharing the recipe. This was a delicious! I love the rice crust, especially being on a gf diet. Any idea what the calorie/fat count is per serving? Very good idea.Nice change , potato also works for a crust too. I love the idea of using milk, my quiches normally turn out too dry, but 1 c milk was way too much and after 35 mins my quiche was a goopy mess in the center. I covered the edges (which were tough and brown) with foil and put it in for another 15 mins to let the milk evaporate and then it was fine and everything was nice and moist. next time i'll only do 1/2 c or 3/4 c milk. Thanks for the recipe!